I’m happy to announce that on September 1st, at 9:24AM, my son Jacob was born, weighing in at 7 pounds 6 ounces. This is why it has been so quiet on this blog for the past few weeks – juggling a newborn as a first time mom definitely has its challenges! He is just over two weeks old now, so we are starting to settle into a routine. Obligatory newborn photos below! 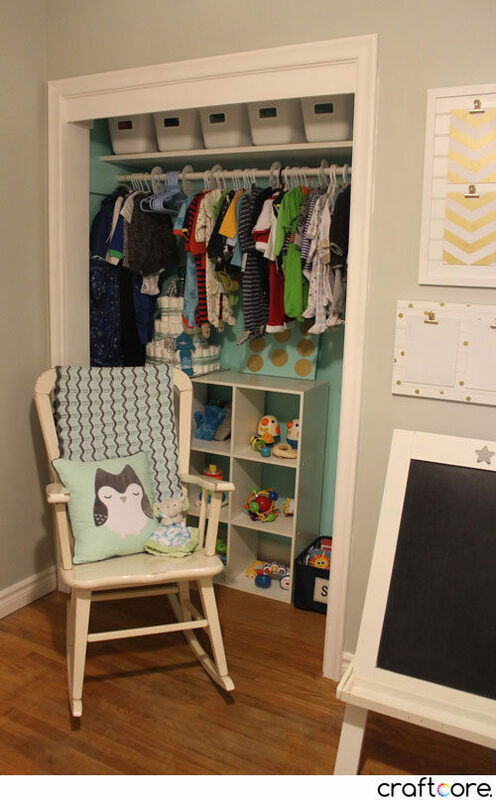 My husband and I decided to turn the smallest bedroom of our three bedroom bungalow into Jacob’s nursery. This room was originally my craft room (click through for photos of how the room used to look set up as a craft room), but I decided to shift the craft supplies to the slightly larger spare bedroom since there is a lot more furniture and equipment in the craft room compared to the nursery. 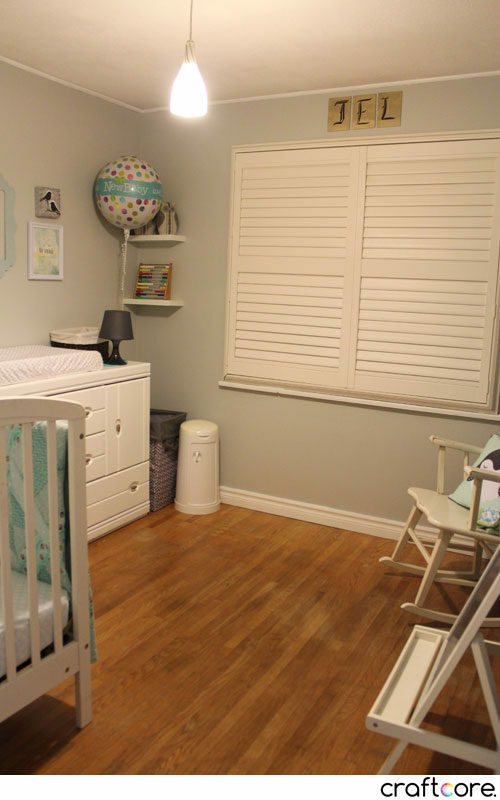 The nursery has become my favourite room in the house. It’s so soothing and relaxing! The room really came together with the help of friends and family. Pregnancy limited the DIY projects I could work on because of fumes, etc. Some of my friends repainted the walls, changing it from a pinkish-taupe colour to a serene grey with a slightly mint undertone. 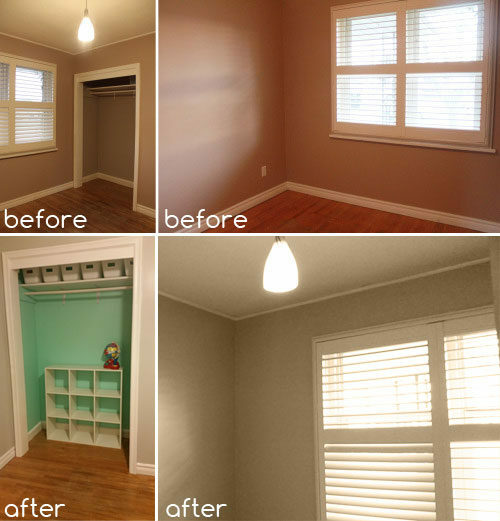 The closet was painted with a pop of bright mint. I love it! I decided on a white, grey, and gold colour theme. 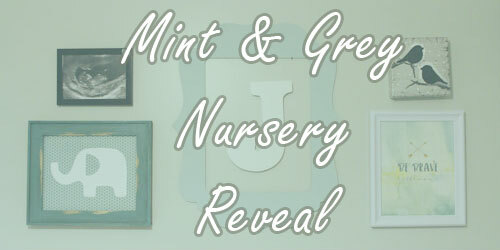 The mint and grey colours were directly pulled from my grey and mint diagonal slice baby quilt that I have hanging over my baby’s crib. I absolutely love the fabrics and used them as a spring board for the entire room’s design. 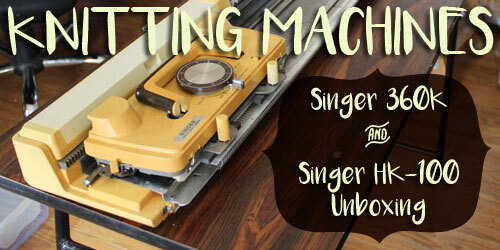 I had a shoestring budget for this room, so I utilized thrift stores and DIY projects as much as I could. 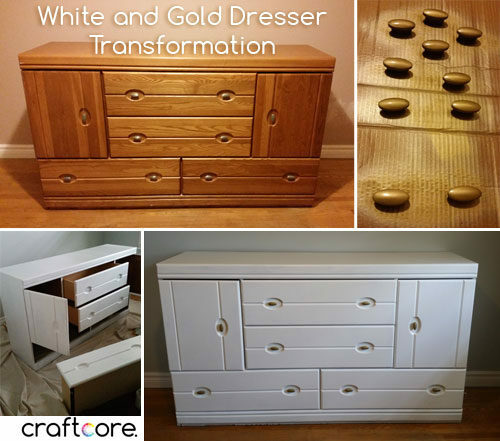 The dresser was a Value Village find that was painted white – read about that at the bottom of this post for more details! The crib was a free Varage Sale find with great timing. It was posted for free for the first person who could come and claim it, and I responded to the listing within 15 minutes and we picked it up within 30 minutes. It was missing some of the hardware but my husband is handy (huzzah for having a mechanic in the house!) and he was able to source the necessary parts to assemble properly. The rocking chair actually came with the house when we purchased it. It was placed in this room as a piece of staging furniture, and we had asked the previous owners if we could keep the furniture in the home as part of the asking price. It’s not a super comfortable rocking chair, but it works for now. 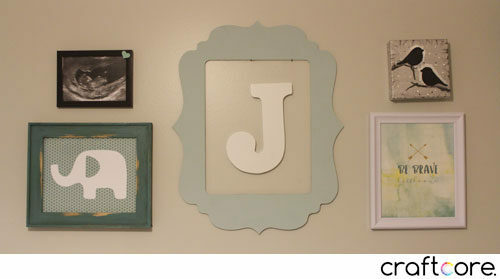 The JEL artwork was made by my friend Lea and they are my son’s initials. The new baby balloon was from my baby shower (and has long since deflated, hehe). 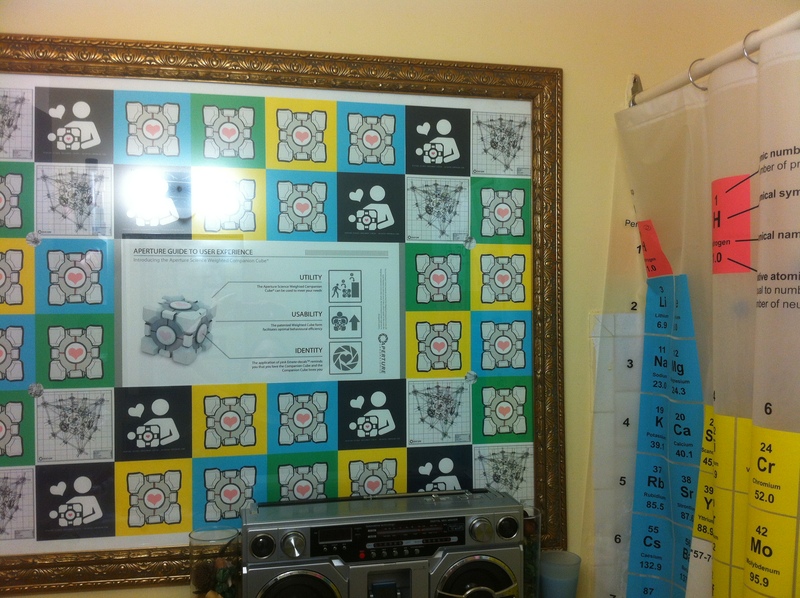 The abacus was a thrift shop find – it adds a pop of colour and can be played with when he gets to the counting stage. I may need a rug for the floor when Jacob is older for a softer play surface. I couldn’t find a rug I loved enough to purchase. The cube shelf unit inside the closet used to be in my craft room, but I decided it would be more useful as a storage unit for infant toys and books. 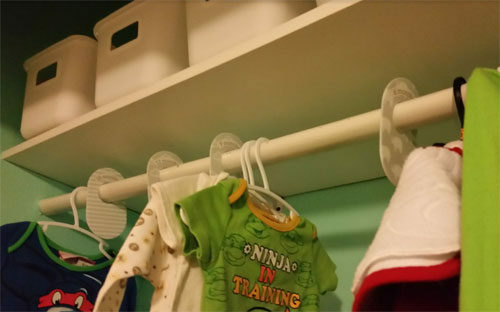 I added plastic bins in the closet for more storage options and dividers to organize the clothing by size. I love the gallery wall above the dresser. My sister gave me the J artwork and the elephant artwork. The ultrasound photograph is the same one as shown in my ultrasound pregnancy announcement article. I painted the two birds on the silver and grey backdrop on a canvas. I bought the “Be Brave, Little One” print from Oh My Inspired at the 2016 One of a Kind Show in Toronto. 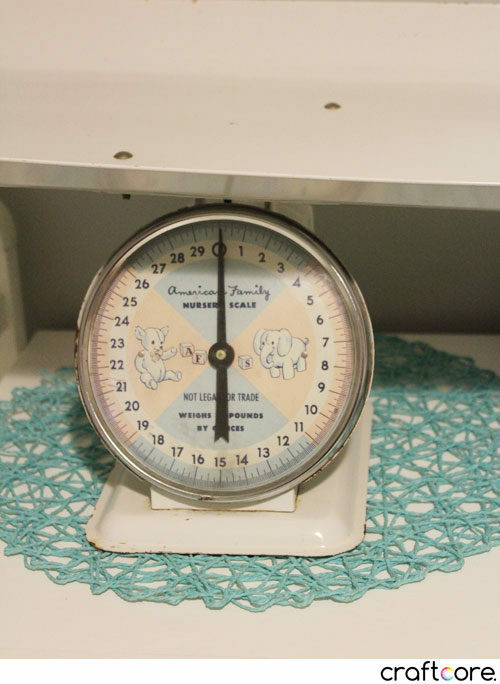 The white vintage baby scale is so charming! My sister gave this to me as well. She always finds the neatest stuff while thrifting! It works great too. 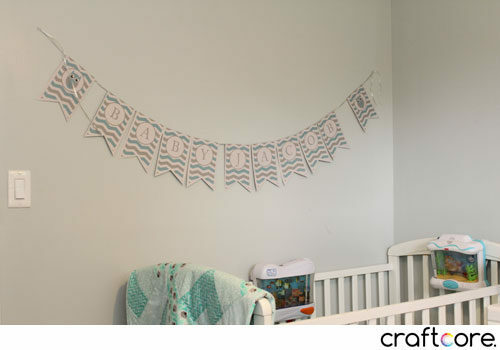 I added the banner after my baby shower. It was part of the party decor but it was too cute not to keep! This is the art area. 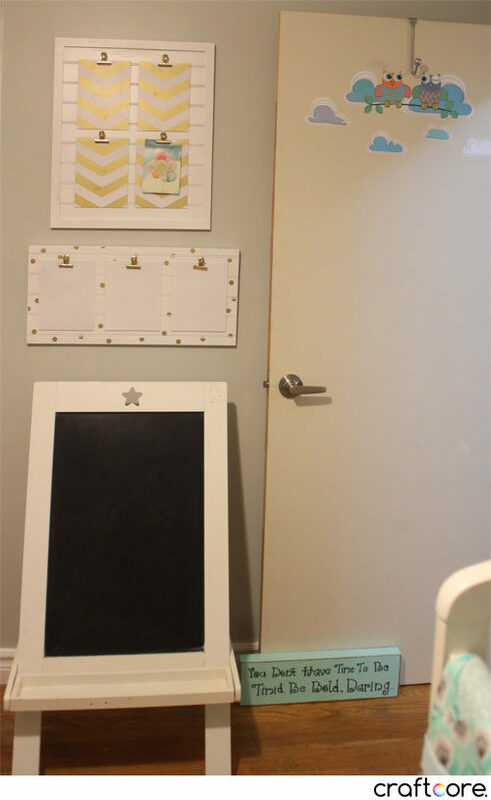 It won’t get much use until the toddler years, but I couldn’t resist this chalkboard I found at the thrift store. The artwork clip hangers were a gift from my friend Lea, along with the wooden sign that’s holding the door open. 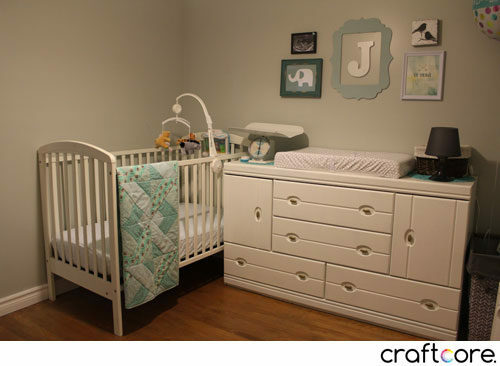 All the elements of the room have come together to make a space that is just perfect for Baby Jacob. I’m so pleased with this room. This piece of furniture is pretty large for the room, but I really love the configuration of the drawers and cabinets. It was an inexpensive Value Village find for $35. My friends reworked the dresser into the change-table-dresser-combo I was looking for. They primed and painted the dresser a brilliant white and spray painted the knobs a matte gold. 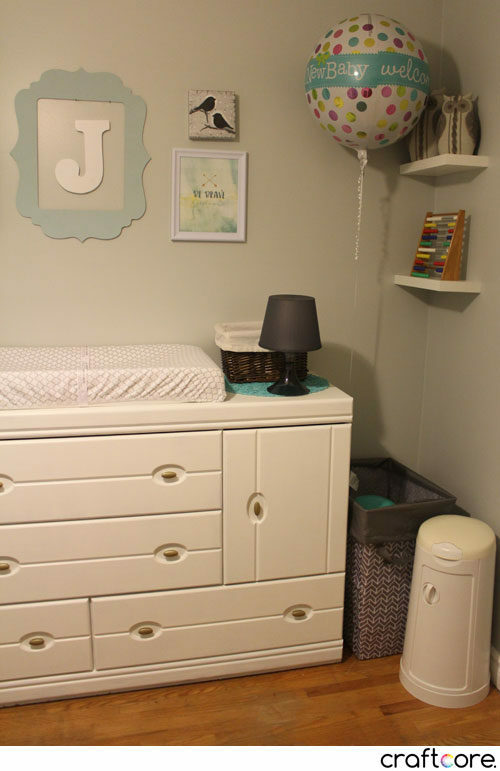 The cabinets are great for storing the excess diapers, wipes and other bulky baby supplies, while the drawers contain clothing, bibs, sheets, blankets, and all sorts of other baby accessories. 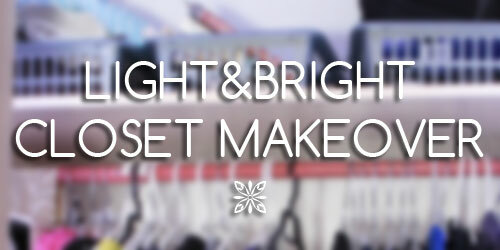 A little paint is all you need to make a dresser of your dreams! 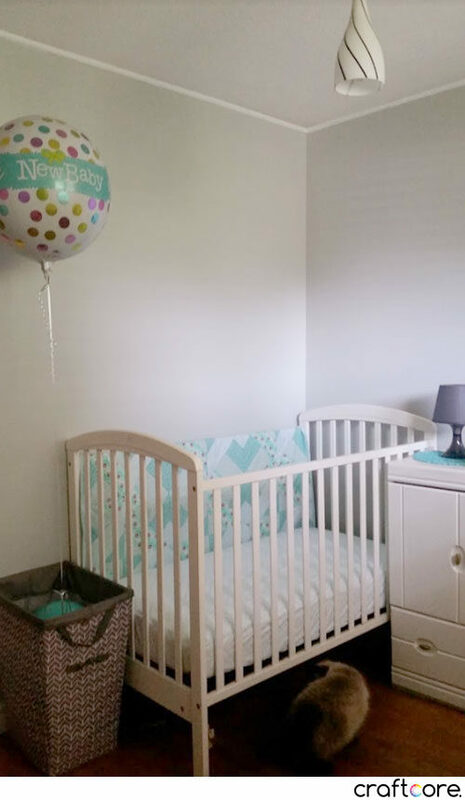 I’ve made a few changes to the nursery, naturally, as our needs change. Here is an updated tour in video format. Enjoy! If you have any questions about the room, feel free to leave me a comment below!